Photo credit: U.S. Army Corps of Engineers. Click for more information. NC State researchers are launching a project to assess the impacts of the 2018 hurricanes on North Carolina by making use of the people who know the affected counties best. “We know that thousands of undergraduates at NC State are from counties that were hit hard by Hurricanes Florence and Michael – and we’re recruiting 50 of them to help us assess the impact of those hurricanes,” says Madhusudan Katti, associate professor in the Department of Forestry and Environmental Resources and the Chancellor’s Faculty Excellence Program cluster for Leadership in Public Science at NC State. Katti is the principal investigator (PI) on a one-year, $200,000 grant from the National Science Foundation that makes the project possible. To train students in ecological assessment. 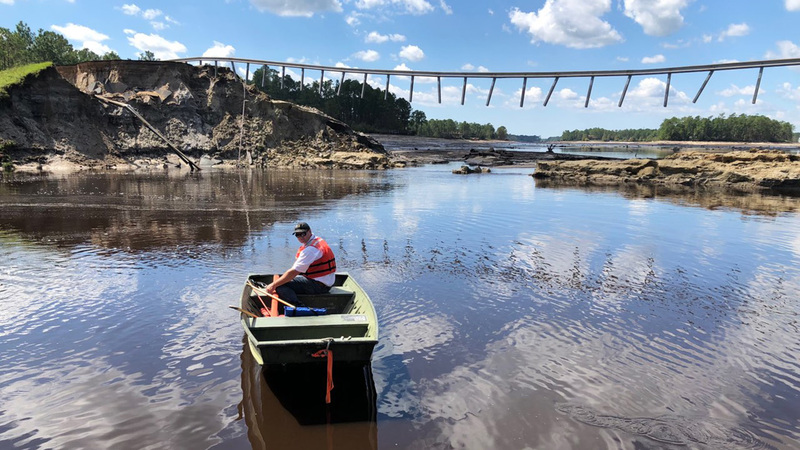 The project will focus specifically on urban and suburban forest ecosystems, and the researchers are actively recruiting students from hurricane-affected counties in North Carolina to work in their home communities. Students will receive training in how to use tools, such as 360-degree cameras and video equipment, to perform ecological assessments and to collect oral histories from residents in study areas. The oral histories will focus on how and whether local residents have perceived ecosystem changes due to the hurricanes. “Students will be involved from the earliest planning stages, since we want to get input from people with local knowledge when selecting study sites,” Katti says. Students will receive a $1,000 stipend in addition to relevant training. Access to research equipment, and training on how to use it, is being provided by NC State University Libraries. As part of the project, students will work in two-person teams. Early this summer, each team will be assigned to assess 20 sites. Students can also choose to be involved in analyzing the data, with the option of taking part via an independent study course for academic credit. “We are also planning to give students the chance to present their findings to the public in the fall,” Katti says. The research project is being led by an interdisciplinary team of researchers, including co-PIs, Deniz Eseryel (Department of Digital Learning and Teaching) and Darby Orcutt (NC State University Libraries). The project is also partnering with the Center for Geospatial Analytics, the South East Climate Adaptation Science Center, the Public History program, and the Visual Narrative Initiative at NC State.